Sencera Co., Ltd. is a leading Humidity Sensor Maker and Shock Sensor Maker manufacturer specialized in Humidity Sensor Maker, Ultrasonic Transducer Maker, PIR Sensor Manufacturer, Shock Sensor Maker, Pressure Sensor Maker, Temperature Sensor Maker, UV Sensor Maker, Gas Sensor Manufacturer, PIR Sensor Maker, Tilt Sensor Maker, Humidity Sensor Manufacturer, and Shock Sensor Manufacturer. The vision of Sencera Co., Ltd., is to specialize in manufacturing, marketing, sale, ODM for customers new sensors and relative sensor modules. The company is established in 1998, however we have the experience in this domain for more than 20 years. 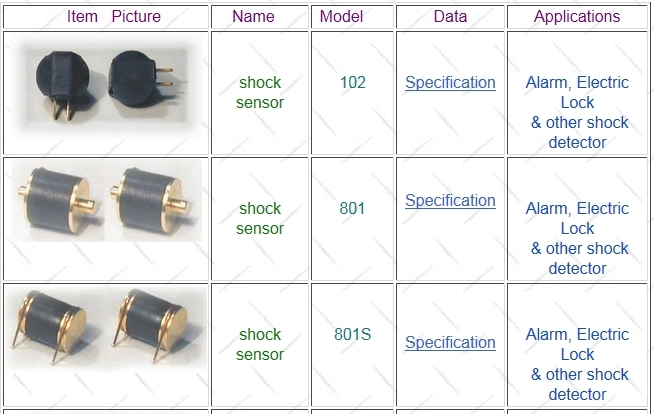 Our products include Humidity Sensor, Temperature Sensor, Shocking Sensor, Tilt Sensor, Air pressure Sensor, Ultrasonic Sensor, PIR Sensor,Gas Sensor, etc. With persistence in the research and development on sensors. Sencera Co., Ltd. owns several sensor patents one after another in past years, such as?G 1 IV fusing Detector Patentto reduce nursery cost 2 Shock sensor Patent 3 Key chain type Alcohol Detector Patent 4 Ultrasonic Contact Lens Cleaning Patent 5 Ultrasonic parts Patent, etc. Sencera Company Ltd., will continuously persist in sustainable development in Taiwan as usual, by way of professional task-sharing paradigm and economical batch manufacturing?C Furthermore, to develop through the invention of more humanistic sensor products to cope with the service demand of our daily life. Please send us your inquiry today regarding our Humidity Sensor Maker, Shock Sensor Maker, Ultrasonic Transducer Maker, and other products.